Elsevier is pleased to announce the release of the 2013 Journal Metrics based on Scopus data. I insist that Elsevier call me Dr. Whitehead. Here are the composite rankings of journals that might contain a majority of papers with environmental and resource economics topics (plus the agricultural economics journals where there is not a majority). 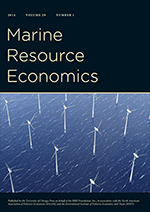 if you are wondering about some other journals, e.g., Natural Resource Modelling, my search criteria included "economics" in the journal title. I didn't feel like sorting through everything.